What you wear on your legs, while in the cockpit, is very individualized. Each Instructor will have their take on how they organize the various items. Normally, their technique will be grounded in the fleet platform from which they came. This section looks at one technique to get you started on the right foot. Realize as you fly, you will find yourself tweaking or re-organize to meet your needs. Room is at a premium once you are in the cockpit, sitting down, and strapped in to the seat. Additionally, you will have all of your egress gear on which will both take up even more space and limit your maneuverability to readily get at things such as publications. The key is to know what is necessary to have readily available as well as where to put or wear it. Lets start with a kneeboard that you can wear on one of your legs. You are not required to wear a kneeboard but it will take care of multiple things at one time. First, the kneeboard should have a substantial strap as it will have to go around your G-suit and needs to hold tight as the G-suit inflates. I always preferred the Velcro type attachment (a good 2-inch strap) vice a buckle or clasp as it made it easy to put on and remove. Next, it should not be so oversized that it interferes with the control stick or power control lever movements. Once you have a kneeboard, you need to lanyard a writing utensil to it. This will keep you from fodding a cockpit should you drop the pen. If you were to drop it or have it come dislodged in flight, you could retrieve the pen via the lanyard. You will not be pulling a pen out of your flight suit pen pocket each time you need to write. Also, the lanyard should be long enough to write but short enough to not get caught on the controls and switches. You are not repelling with the lanyard! 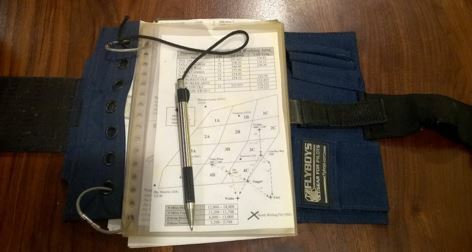 Another issue to resolve will be what to attach to the kneeboard with some checklist loops. I preferred to attach the small IFG (described in the IFG Section) as it was all the information I needed to be easily accessible each flight. 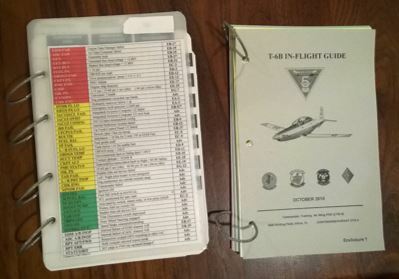 Some students will attach the regular IFG but you will find it is: way to bulky, not user friendly by pages, a real pain to try and use the backside-page while flying, and the pages eventually tear apart. Whatever you decide to attach, remember that the backside-page (as shown in picture) will be hanging down and impossible to read or will lay over and interfere with the controls. Finally, underneath whatever you attach to the kneeboard should be a hard writing surface. 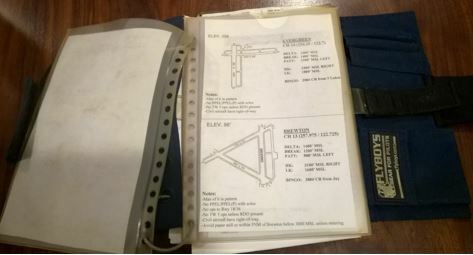 Most kneeboards will have a holding-clip like the picture. 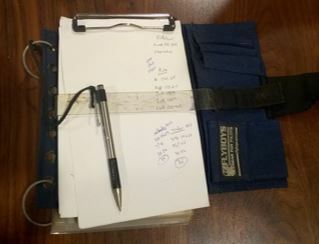 You may put an individual sheet of paper or small note pad to write on. To start, I would recommend you use the lineup card so you can write clearances and ATIS information and it is already organized for you. Immediately behind the lineup card, you could have your radio call gouge sheet for easy reference reminders. In dealing with the Quadfold Checklist, you need to protect it some way. You can fold/cut it and place it in a checklist page protector (as shown) or you can laminate it if you have access to a lamination machine. Some prefer to quad-fold it so that it is smaller. I found that folding it in half was all that was needed. This was because I had to use my index finger to follow along on the checklist as it was on my leg. Additionally, the front side of the checklist ran through the Overspeed Governor Check so I could then flip it over and have the rest of the checklists readily available thru the Engine Shutdown Checklist. 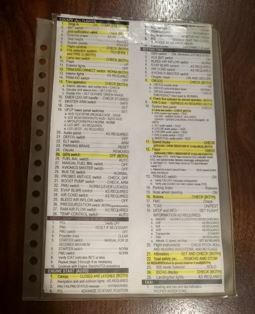 The Quadfold Checklist is normally secured to the leg that does not have the kneeboard. You can use the elastic strap that is on your G-suit or you can purchase a leg strap like the one shown. A good 2-inch leg strap with a clear retainer will work to hold the checklist to your leg. Also, as you go into the instrument phase, you can use the strap to hold your approach plates to your leg. Investing in one would be a smart move. What does not normally work well is to place all the items on the kneeboard. Between referencing the checklist, or referencing the IFG, or writing something down, it is too much in one single location. It tends to be more cumbersome doing it in that fashion and you find yourself flipping things over to get at the necessary information. 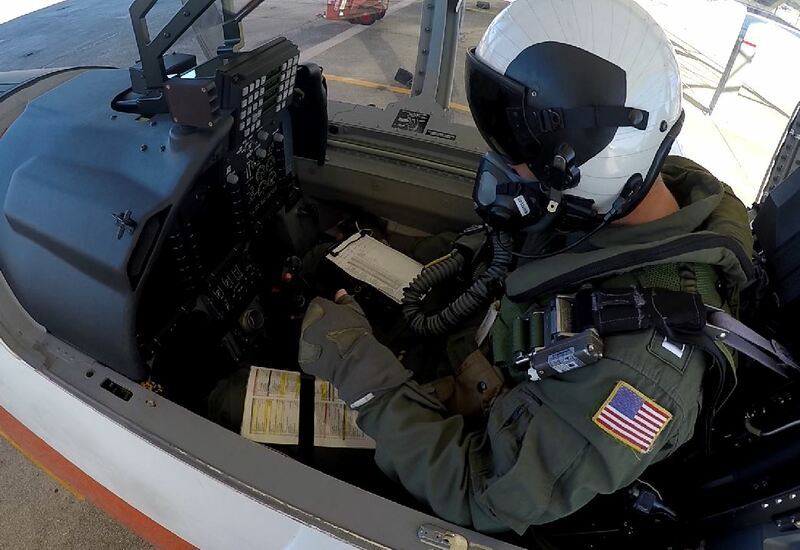 Pictured below is an Instructor in the cockpit with full flight gear on. 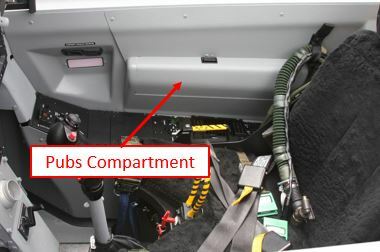 This shows you the relatively tight cockpit space. On his right leg is his kneeboard and on his left leg is his Quadfold under the G-suit strap. This all leaves one last item to cover. Where do the PCL, IFG, Florida Approach Book, and Charts go? You will put them into the publications compartment on the right side of the cockpit. I normally put the PCL/IFG in the front and the rest of the pubs in the back of the compartment. This made it easy to get at the PCL or IFG if I needed to reference them. As an emphasis point, there is NO REQUIREMENT to fly with the IFG on your leg. While it has good information in it and most feel they will need that information in flight, they will soon find that they only reference a few pages from it during a hop (hence the small IFG). To conclude, this section showed you one way of setting up your cockpit or what you should have on your legs for each hop. While it is one way of doing things, it is a good place to start and you can modify to meet your needs. You have plenty of simulator events before you get to the flight line. During this time, you will begin to solidify how you want things set up. Disclaimer: This site is not associated or officially endorsed by the U.S. Navy, CNATRA, TW-5, or any other government entity. Use and results of the information on this site are at the discretion of the user and not the responsibility of T6BDriver.com. Much of the information on this site is the property of T6BDriver.com and should not be copied and altered without express permission.